Fork of Horripilation is a unique legendary Neutral item card. It is part of the Isle of Madness story set. 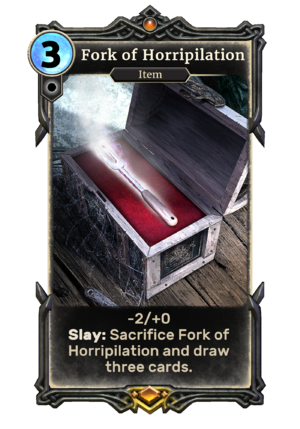 This card features the Fork of Horripilation, a cursed artifact created by Sheogorath. This page was last modified on 19 January 2019, at 16:19.